Demand for Our #Mobile #Medical & #Culinary #Workstations is on the RISE! When we began building #mobile #workstations (25+ years ago! ), we knew that #quality and #function had to go together simultaneously. What we soon realized, was a strong need and void across multiple industries, for products like ours! We started in #sports, which subsequently inspired some of our #medical products, which then became a #specialized product category of its own as orders for specific requirements, situations and circumstances came in. Our most popular #medical products are the #Vaccine Workstation, the #Nurses Workstation, and the #Infectious #Disease #Cart. All of which are self-contained and completely mobile – they are #durable, provide quick and efficient means of storing, transporting all of your medical supplies and include #nonporous #materials and each can be #customized with many additional #options. Check out our #Medical #Workstations. Our mobile #kitchens (originally designed for the Culinary Industry) have now found their way into #schools, #community #centres and even #hospitals around the world. Here are our #Mobile #Kitchens. You don’t have to be a large organization to put one of our products to good use. Many businesses sponsor a #workstation to the #team, #organization or #school of their choice and we ship it directly to the recipient, complete with optional #custom #colors & #logo affixed. As we head into this much-needed summer weather, we ask you to keep your heads up and your eyes open for our workstations, as well as opportunities for our workstations – the impact one workstation can make is astounding. Stay tuned for more exciting updates & pictures including our new innovative products - it’s going to be an exhilarating summer! 2017 was a whirlwind of travel, excitement, new friends, sports conferences, more travel, medical conferences, culinary shows, celebrating our 25th year in business, our dear friend's book launch highlighting one of our best selling products and the initialization of many fantastic collaborative projects and relationships that we are feeling very passionate about. Please feel free to contact us by phone, email or through our CONTACT US form - we'd love to hear from you & look forward to working together in 2018. 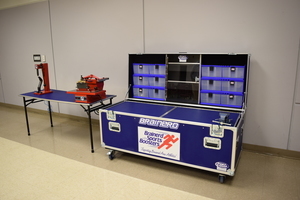 Hockey Storage Case - Make it part of YOUR team today! Mobile, heavy duty & light weight. 18 custom team colors w/logo. Supply tray with tool pallet & file folder. Table fits & stores in the lid. Large bulk storage capacity below surface. Your sport season is here... Are you ready?? the way you play for 25 years! Order your custom workstation now, and take your team to new levels of awareness, both on & off the playing field, court or ice! Your logo(s), team color(s) and even sponsorship opportunities will further establish YOU as the PRIME PLAYER at all games and events. Have you ever met someone that TRULY stands out? Who gives so much more than they take? Who not only wants to make a difference, but actually DOES? We met Stephen Ritz just a few short years ago - a serendipitous event that has forever changed more lives than we can count, and we are SO very grateful and proud of the work we've done together since that chance conference meeting. Stephen's passion for making a difference in his community has far outgrown and well exceeded the boundaries of the Bronx, where he began his mission to turn one of the nations poorest communities into a school of thriving students who grow, cook and eat their own produce. Together, we created The Green Bronx Machine - a #Mobile #Classroom #Kitchen that teaches kids some of the most important fundamentals of food and healthy eating. Today, Stephen travels the world educating and facilitating his program and values, much like the seeds he plants and cultivates with his students - the concept has flourished and the need is for something like this can be found in EVERY community. FINALLY - A MOBILE PROFESSIONAL GRADE KITCHEN!! Our customers know us for quality, mobility, durability, and commitment to Industry Professionals. For more than 25 years now, we've been specializing our products to better meet the changing needs of each industry based on customer needs and feedback. What you're about to see below is the FIRST MOBILE PROFESSIONAL GRADE KITCHEN, which is taking chefs, grocery stores, trade shows, health care, schools, recreation centers, sport stadiums and much more by storm! 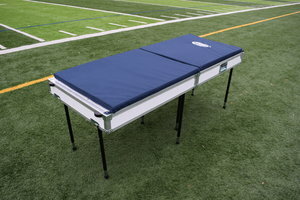 There isn't a single organization, facility or special event that couldn't benefit from having one of these on-site. WATCH THE VIDEO TO SEE WHAT WE MEAN - IT'S THE MOBILE KITCHEN THAT DOES IT ALL! Please feel free to get in touch with us through our CONTACT US page for order inquiries or questions. If you can read this, #thank a #TEACHER! We can't even begin to summarize why teachers are so important - not just to each of us as individuals, but also to our communities and the planet as a whole - TEACHERS MAKE THE FUTURE BRIGHT! We are really looking forward to our time this week at the #AFTTEACH #CONFERENCE where we will have the opportunity to personally meet with and thank each and every attendee for all the hard work they do on a daily basis to enhance the lives of students across the USA. We will be sure to share some of our fun & photos from the show, where we'll be showcasing the GREEN BRONX MACHINE, our #Mobile #Classroom Kitchen for THE VERY FIRST TIME at this event! If you're planning to attend & would like to book a specific time with us at our booth, we can be reached HERE or at Debra@StephensonCase.com. Please note we will be at the expo on Thursday & Friday, we will not be there Saturday so PLEASE be sure to swing by and say hello before then! In just two short weeks we will be attending the AFT Teach Conference in Washington, DC (which happens to be one of our FAVE places in the US). Teachers are so important, and play such an important role in our society - we can't wait to meet & thank every single one in-person for the great work that they do with students across the USA. We will be at the show with our good friend Stephen Ritz and the #PortEquip GREEN BRONX MACHINE MOBILE CLASSROOM KITCHEN doing live demonstrations and showcasing the many wonderful features of this fabulous product. Our Mobile Classroom Kitchen is teaching kids the most basic and important fundamentals of proper nutrition. In addition to culinary education, the Mobile Classroom Kitchen is FEEDING students & schools across the WORLD! We are working very hard to get at least one in every school and want to work with partnering organizations, sponsors and even parent & community councils to make the Mobile Classroom Kitchen readily available in every community.